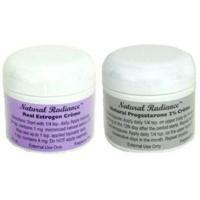 ・PROGESTERONE: About 1/4 teaspoon (1.2 ml) equal 20 mg of micronized natural progesterone USP. Purified Water, Vegetable Oil Blend, Aloe Vera, Sepigel 305, Potassium Sorbate, Sorbic Acid-ed, natural progesterone USP. ・ESTROGEN: The natural estrogen, estriol USP, is made the same way natural progesterone USP is made. Sterol analogues found in many varieties of plants are combined with specific bacteria and the resulting hormone is bio identical in chemical structure to the hormone produced by the human body. Radiant Laboratories seeks out the finest herbs and bio-identical ingredients available and combines them with the highest quality cleanest base using cold process manufacturing technology to deliver the best transdermal products available. Our products deliver their active ingredients at the highest potency and bioavailability possible.